These high-resolution transmission electron microscopy images, produced at Berkeley Lab's Molecular Foundry, show a sheet of covalent organic frameworks (COFs) at the nanoscale (top row) and a sheet of chemically modified COFs (bottom row). Image: Berkeley Lab. Hollow molecular structures known as covalent organic frameworks (COFs), which could serve as selective filters or containers for other substances and have many other potential uses, tend to suffer from an inherent problem: It's difficult to keep a network of COFs connected in harsh chemical environments. The conventional chemistry for linking building blocks into two-dimensional (2D) COF sheets or three-dimensional (3D) COF frameworks is reversible. This reversibility makes the connections within COFs weak and unstable in some chemical environments, limiting the practical applications of these COF materials. Now, a team at the US Department of Energy's Lawrence Berkeley National Laboratory (Berkeley Lab) has used a chemical process discovered decades ago to make the linkages between COFs much sturdier, giving COFs new characteristics that could expand their applications. "It's like a 'weaving' and welding approach," said Yi Liu, a staff scientist at Berkeley Lab's Molecular Foundry. Liu led a team that found out how to strengthen the weakest links binding COFs. The team’s simple chemical approach targets a chemical reaction at the area of these weak links, forming resilient bonds that were shown to hold up – like a strong weld – to harsh chemical environments during experiments. The team reports its findings in a paper in Nature Communications that also details how the approach works. "Here we show that these bonds are exceptionally stable to a variety of chemicals. We've tried harsh conditions and it still sustains these bonds," Liu said. "This beats everything reported in the literature." The chemical transformation, he noted, also makes the bonds between COFs more useful by changing their electronic and optical (light-based) properties. "They can transfer electrons more easily after the reaction," he said, causing 2D layers of these strongly bound COFs to behave more like graphene, another exotic 2D material that exhibits special electronic and optical properties. "We gave that reaction process, first reported in the 1960s, a new life. We applied it to COFs for the first time," said Xinle Li, a postdoctoral fellow at the Molecular Foundry and the study's lead author. COFs have been heavily studied because they are highly tunable and can be composed entirely of light elements like carbon, hydrogen, nitrogen and oxygen – unlike related structures known as MOFs (metal-organic frameworks) that contain heavier elements. Scientists can make COFs with different pore sizes that can impact their function, changing what can pass through them or what can be contained within these pores. This could make the COF-based materials useful in systems that filter unwanted chemicals from water and that reduce carbon dioxide into other value-added chemical forms. They could also serve as highly efficient facilitators for other types of chemical processes. An important aspect of this study was the use of advanced imaging techniques, such as high-resolution transmission electron microscopy (HRTEM), at the Molecular Foundry to see the structure of the bound COFs. 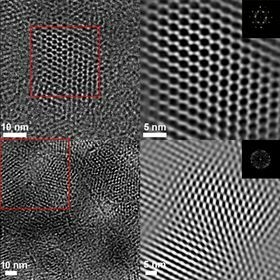 According to Liu and Li, the images obtained, which clearly show the honeycomb-like lattice of 2D COFs, are among the best images yet of COFs, confirming the chemical changes in the COFs down to a fraction of a nanometer. "Before and after the reaction, the pore size changes by about 0.3nm," Liu said. "You can see these differences before and after the reaction." To carry out the chemical modification reaction, the researchers placed the COFs in a liquid solution heated to about 230°F and then stirred it up. They say it should be possible to scale up the amount of COF-based materials, and the team has already experimented with using COF sheets with other material layers to customize the function of the combined material. The team plans to test ways to automate the production of these COF materials, and will also pursue ways to make the reaction process more efficient. In addition, the team will explore theories to help understand and improve upon the COF-altering chemistry. "We want to make this chemical modification process even faster and better," Li said. "We hope we can make the reaction conditions milder, and further increase the chemical stability and functionality of COFs." The team's work is one of the first published efforts of a new program at the Molecular Foundry aiming to advance ‘combinatorial nanoscience’. This is focused on using high throughput processes, in combination with theory and imaging technology, to create and study nanostructures that are components in new materials with enhanced properties. By combining a covalent organic framework with a conducting polymer, scientists have produced an efficient electrode material for batteries.